Meet my ethereal, powerful, gold-trimmed playsuit Cybele, by The Pretty Dress Company! I previously had not owned many one shoulder garments, and I'm mesmerized by the playsuit execution paired with gilded opulence. My mind especially envisioned deco days of the 1930's, with extravagant gold & doll-like showgirls! Yet I could see myself styling this vavoom design with inspiration from the 30's all the way to the 1960's. It is such a versatile piece, and with a nice weight to the fabric (controlled lining!). 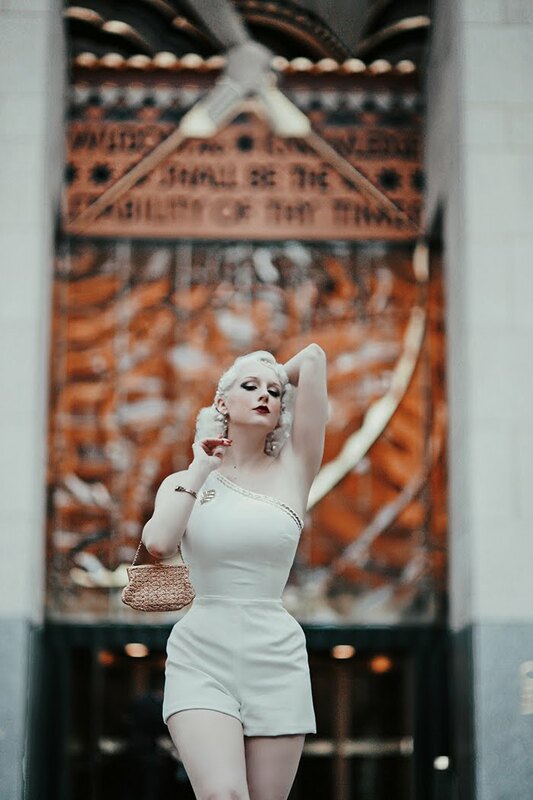 Famed Rockefeller was a perfect setting for Cybele, and I am overjoyed to be highlighting one of the most iconic Art Deco architectural pieces of 1933, Wisdom. Also displayed below, is the 1934 classically ornamented "Friendship Between America and France" and of course Prometheus at the ice rink!